Hydraulic equipment is vital in modern machines that use mechanisms needing large amounts of power, such as construction equipment, machine tools, and vehicles, and this equipment needs ultra-precise strong parts. 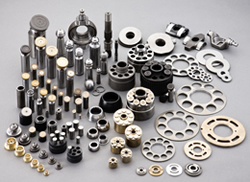 In the field of precision equipment, Takako is recognized worldwide for our reliability and our precision manufacturing methods nurtured as a hydraulics equipment parts manufacturer. Worldwide we manufacture 20 million piston assemblies, the heart of axial piston pumps, with a Japan domestic share of 80% and overseas share of 65%.